Strawberry Mojito is the perfect drink for a hot summer afternoon. 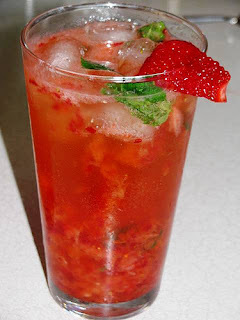 The strawberries in this mojito not only add flavor but antioxidants too. Combine strawberries, two lime wedges, and mint in a large glass and crush with a muddler until strawberries are juicy; add your rum and stir gently. Pour mixture evenly between two glasses, add ice and top with soda water.